The story of my journey into DEW shielding has to do with a simple process. I lay on my bed and go to sleep. In the morning, I see what’s sore. You see, like many other TI’s, I’m attacked with subtle DEW primarily when I sleep (when I’m stationary which is ideal for directed energy microwave weapons). Generally what’s sore is the part of my body that was not shielded from DEW EMF (click this link to see my analysis of the frequency range of TI DEW: 18–50 GHz). So if something’s sore that means I need to add or improve the shielding I have. Common sense dictated I shield my chest/mid-section first (with all your organs, lung, heart, etc.) and head. (to see my full list of shielding solutions, click this link). Beyond this, there are still many areas to address. It’s important to note that most of my TI shielding options are taken from the medical community (lead and alt-lead vests etc.). There they block high frequency X-Ray where the main concern is cancer and damage to organs. So they really don’t care about what happens to your shoulder! Nor do they have great solutions. If you’re using my lead vest recommendation, one option is shoulder shielding add-ons that connect to the lead vest. There are many makers of them; I bought lead apron sleeves from SchureMed. 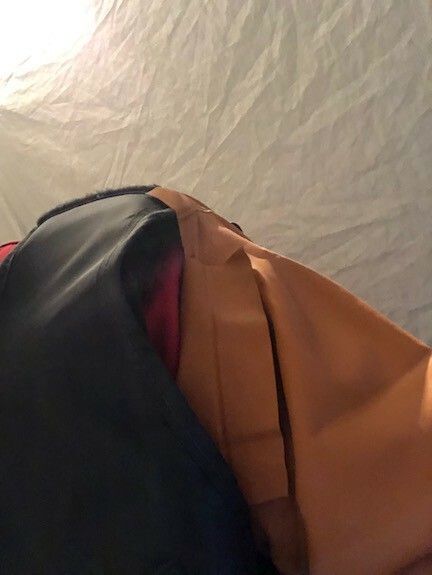 I was able to affix these shoulder sleeves to my lead apron using both stitching and crazy glue (I crazy glue the velcro strap to the apron and then connect the shoulder add-ons to the apron with the velcro strap — it can be easily added and removed). 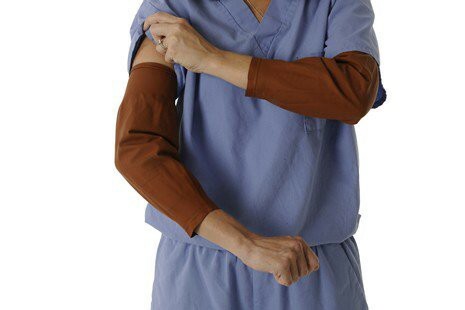 These work in the sense they stay in place and shield the shoulder. My problem is that they are too heavy- at 1.8 lbs each. These shields I believe are meant for short-term medical use like taking an x-ray not for hours at a time. Next I got lighter shoulder sleeves from InFab. The InFab sleeves weigh ~0.3 lbs- 6 times lighter than the SchureMed. Believe it or not, I also found these too heavy. I woke up sometimes with some soreness from the constant pressure of the sleeves. Also they would pull the lead vest more towards my shoulder which forces them to bear more weight from the vest. I now use a makeshift solution by making modifications to the XGuard rubber sleeve so it covers my shoulders (and upper arm). 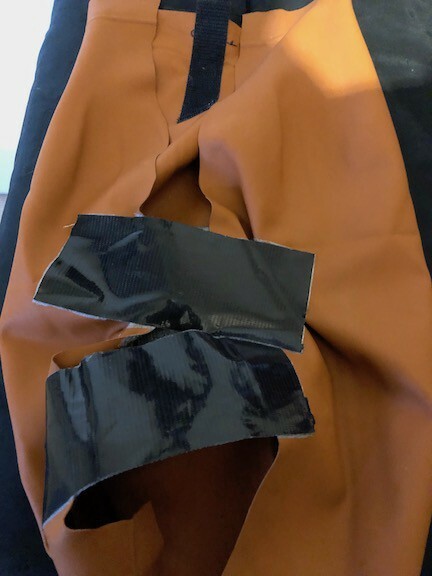 What I decided to do was use the XGuard Radiation Reducing Sleeves made of rubber- and cut them open (and then tape them), to make them wider so they would cover my shoulders. These are super light. I add an industrial-strength velcro strip to the shoulders of my lead vest and one of the other kind to the inside of the rubber shoulder sleeve- that keeps it in place. They do the job in terms of covering the shoulders and upper arm and seem sufficient to shield against the DEW I’m being hit with. Rubber has EMF shielding properties. 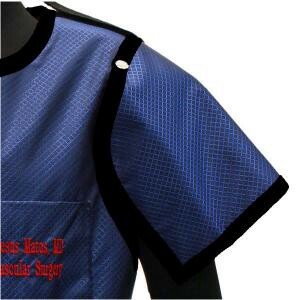 The XGuard sleeves are used in x-ray environments and are sufficient to block scatter radiation. I’ve read other sources that show that certain kinds of rubber show a shielding effect of 60 dB up to 10GHz (60 DB = blocks 99.9999%). Whatever the data, I’ve found in real life experience that these seem to block the DEW I am hit with. So far I’m thrilled with it. It’s light enough that I could even wear these during the day while I’m using my shoulders- they’re that light, they don’t weigh you down at all. No more shoulder/upper-arm DEW soreness when I wake up!